I was reading the Medium article “What You Know About Google Adsense And What You Don’t Know About it” the other day which brought me to wonder how many authors realise the full potential of their work. Some may start a blog to solely reap the benefits of banner ads, but how many are aware of how to maximise their benefit from the true value their content provides? Putting your hard work into developing a piece of content can be rewarded on a variety of spectrums: accomplishment, a fatter bank account, and possibly recognition. However, this is unsustainable for authors that are unevenly or insufficiently remunerated for the hours of work put into quality journalism. Authors should be more aware of the alternate methods they can use to fund their content in order to have a more transparent system and push out quality content. Hence, in no particular order, below are the top five ways to monetise your content today. 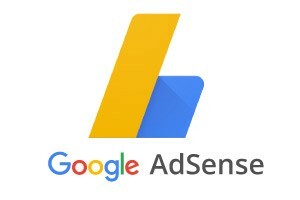 One of the most renowned ad networks around, Google AdSense is possibly the most commonly used tool by many bloggers and journalists to monetise their content. There are two ways to do this: CPM and CPC. Cost-per-mille (CPM)depends on impressions, and pays you a set amount of money every 1000 views your page receives. On the other hand, cost-per-click (CPC) will pay you a certain percentage of the ad revenue every time a reader clicks the ad itself. I think this is a good way for authors who accept serving “free” content while developing a viewership in the early phase. Another possible downside is that Google does not disclose payment information or how much revenue you will receive from the ads displayed. This may impact budgeting while contributing to the underlying causes of uncertainty that authors may face when determining the value of their writing. Yes, paying for each article that you choose. Possibly unheard of? Let me explain. 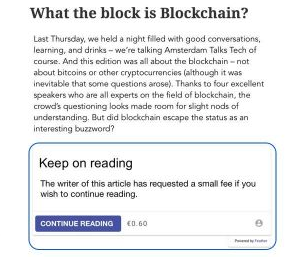 I see micropayments as an intermediary stage between ad-driven and subscription-based content: you are not committed to reading 1 source (since most people don’t like being confined to specific sources) but are still willing to pay for quality journalism. Furthermore, I think this pay-per-read model is a pivotal step in driving readers to the end goal of subscriptions, which ultimately provide authors with the most certainty given they have a better conception of what they will be earning. Thus, their motivation may be prolonged in order to continue producing high quality content. Like to stay informed? Stay updated our journey? Subscribe today to our Newsletter! However, I read a stat the other day that micropayments constitute around only 5% of revenue streams among news publishers. Why? Well, because of the Internet. Content consumption has become free, and is embedded as the standard among readers. The maximum amount a British adult is willing to pay for monthly news is 92p, says a survey from 2015. In cases where content is charged, chances are that the same story is published elsewhere with free access. However, these cases normally don’t come under the category quality journalism, as they can deftly be replicated and reproduced. Quality journalism is not breaking news or short reports; its value is unique to the reader due to a variety of factors. For example, the author may be an expert in a technical field and will provide a deep analysis of a subject. This is how I believe micropayments will succeed in publication today, as there are consumers willing to pay for such content. In fact, a platform that provides such a service for bloggers, journalists, freelance writers, and news publishers is our own — Feather. We provide a free WordPress plugin that makes it easy for the writer or publisher to monetise content, while enabling the readers with quick access to articles by providing a swift, secure and transparent payment system. Here, readers carry one wallet that can be used across multiple platforms, and can easily pay for each article in a few clicks. If you are interested in using our platform, click here! These are posts where companies in your industry approach you (or if you’re starting out, you usually go to them and convince them why you are suited) to write an article about their product or service. There are sites that facilitate this on both ends, e.g. sponsoredreviews.com. Authors may vary their pricing according to each sponsor, and can even carry out scheduled posts under a contract. However, be aware that some sites do not permit negotiation and only work under fixed prices, as they categorise according to your viewership, traffic and PageRank. Hence, it can be a more difficult to earn money the newer or less-viewed your blog or website is. Sponsored posts are quite popular to use today. The positive outcomes from them include that they mitigate ad banner blindness, while readers will gain deeper insight into the product or service offering. However, Google has instated strict rules regarding sponsored posts in recent years. Unless your sponsored posts only consist of “nofollow” links, your site risks being removed from Google while it may harm your customer’s business as well. How do I solve companies asking for “follow” links only? Lean towards showing your page traffic and viewership, as there are businesses that value statistics ahead of solely follow links. All in all, do remember to not give a biased opinion or review on the product, as this may affect your reputation and credibility in the future. As depicted above, the post does indicate that it is sponsored by an advertiser. However, there are two ways people may still click the post. First, one may not notice the “sponsored” tag and click thinking it is a normal article. On the other hand, the title and preview may bring value to certain consumers due to the nature of the content, is it analytical etc., even though they’re aware it’s an ad. In general, native ads are pay-per-click ads that are well-immersed among other articles that readers don’t hesitate to click because they don’t completely conceive the article to be an advertisement. From a personal opinion, this lies on a subconscious level. Banner advertisements, in general, do not usually carry a positive connotation as they are extremely common and only a small percentage of readers will find value in them. Hence, ad banner blindness. On the other hand, readers who see a native advertisement may immediately attribute some sort of value to the post, since they are receiving a possibly informative piece of content by this business and are not perceived as conversion tools. How to use native ads: make the article visual while blending it into your existent content, ensure it lives up to the premise it claims to provide in the title, inform your readers, and don’t hesitate to add a CTA at the bottom of the article. Done well, these ads can increase your brand awareness and engagement significantly. Nevertheless, take note that creating one is tedious and takes significantly more time than a banner ad for example, given the numerous steps involved. Affiliate marketing can be an easy way to earn some quick money. The most common way is for large companies (Amazon is most popular) to have products they would like you to promote on your blog, and pay you every sale conversion they get from your visitors. You can view the pay schemes of different companies, clickthrough rates etc., and see if it could benefit your business model. Personally, I would analyse my viewership and customise the displayed products towards them while dedicating time in researching product reviews in order to strengthen the user experience and reduce spam. Also, do take note that you should always inform your readers that you are using affiliate links (can be a legal restriction to do so depending on location, but is more transparent nevertheless). Google AdSense: if you’re looking to make incremental income without spending significant time on advertising. Micropayments: if your content has a unique offering and is difficult to replace with a substitute, and your viewership is aware of this. Sponsorships, native advertising, affiliate marketing: if you want to provide your readers with products/services that you really deem valuable to them, and are willing to spend some time accurately defining them.